The fruits of our creativity: music, dance, mathematics, technology, towering high-rises and our awareness of the universe, are the result of evolutionary events that occurred in the murky depths of humanity's distant past. And while it is not known where or why our large brain evolved, it has always been thought that this remarkable evolutionary event was the result of being full-time residents of the ground. Charles Darwin was one of the first to speculate on where the brain evolved. Since few fossil humans had been discovered in the 1800's, he used living humans to arrive at an answer. In his book The Descent of Man, he states: "The ancestors of man were no doubt, inferior in intellect, and probably in social disposition, to the lowest existing savages; but it is quite conceivable that they might have existed, or even flourished, if they had advanced in intellect, whilst gradually losing their brute-like powers, such as that of climbing trees." Brain-size measurements led Darwin to conclude that climbing "savages" had smaller brains than non-climbing Europeans. Based on the weak evidence of those early times, he forged an enduring link between climbing and low intelligence, while declaring that the human brain had evolved in a terrestrial habitat. Stephen J. Gould carefully examines early brain-size data in his book, The Mismeasure of Man, 1981. He emphasizes that a reduced average body size brings with it a reduced brain size, therefore smaller "savages" should have a smaller average brain size than larger-bodied northern Europeans. Whether or not they are climbers, smaller people are just as intelligent as larger people. As an evolutionary biologist who has spent decades climbing and studying the towering trees of the rain forest canopy, I have developed an alternate perspective. Humans are climbers. And we are not just good climbers, we are one of the best climbers in the history of evolution. Of all primates, only humans are capable of climbing a thousand-foot-high rock wall, and at times, some really gutsy individual manages this without direct aid. Over the millennia, humans have climbed to collect honey as well as high-hanging fruit and nuts. Military reconnaissance missions have routinely been carried out from treetops, and cliff-top fortifications have secretly been attacked by climbing. Since we are still adept climbers today, it is safe to assume that our distant ancestors must have been superb. Zoologically, we fit the definition of a scansorial species; animals that both climb and travel at the ground, like bears, racoons and squirrels. Darwin highlights our scansorial nature with comments on the foot's dexterity: "With some savages, however, the foot has not altogether lost its prehensile [grasping] power, as shewn by their manner of climbing trees..." With their ability to secure us to a tree trunk and grip branches, our feet retain vestiges of a recent arboreal past. Although scansorial feet are far different from terrestrial feet, the human foot is usually seen as a paradigm of terrestrial design. Terrestrial feet are often rigid, raised up on the tips of elongated toes and capped by a hoof, as in horses and deer; or the last digit of each toe is bent and padded, like those of dogs and cats. Our feet lack this rigidity. To correct for evolution's sluggishness in adjusting our foot's design to its new, full-time existence at the ground, the feet are usually bound with sturdy materials that mimic hooves. Recognition of our climbing nature alters how we must interpret evidence concerning human brain evolution. The richest source of data are the extremely valuable fossils packed in museum drawers. From the diminutive brain cavity of bulky dinosaurs to the optical bulges of bird skulls, to the elaborate olfactory apparatus of mammals to high-browed, primate foreheads, the largest relative-brain sizes in any given geological period occurred only in species that once climbed trees. Harry Jerison at UCLA formalized this view with equations (subsequently refined by others) that quantified the canopy's influence on the ballooning brain, although there are many exceptions. Opossums, for example, have been climbers for tens of millions of years, but they did not experience significant brain expansion. 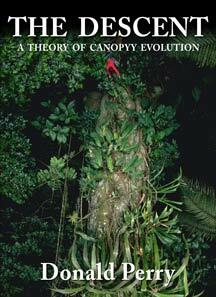 Nonetheless, the canopy habitat has been recognized as the premiere factory of brain evolution for well over a century. As protohuman ancestors began to walk upright, it is thought that the freeing of the hands allowed them to make tools and weapons, which initiated an incessant quest to invent things. This provided the ground-based, feed-back mechanism that would produce a large brain. But what about Australopithecus and Paranthropus? For at least these two genera of early human terrestrial pioneers, millions of years of upright walking and manual freedom did nothing to stimulate their brains' expansion. An ingredient was missing. Terrestrial theories of brain evolution have often focused on human uniqueness. Embraced passionately at first, prized features are often snubbed when it is discovered that they are also possessed by apes. For decades human female sexuality was said to be unique because of a woman's ability to engage in sexual activity at any time. Since most primates and mammals have an estrous cycle that typically limits receptivity to about once a year, the alluring sexuality of women (thought by some to be a terrestrial feature) was sometimes linked to brain enlargement. But fascination with the subject waned when Jeffrey Schwartz of the University of Pennsylvania pointed out in his book, The Red Ape (1986, 2006), that female orangutans and humans have a nearly identical sexuality not shared with chimpanzees and gorillas. Humans and orangutans share other features as well, including mustaches, beards, breast position on the chest, hair length and many more. Recently Schwartz was joined by John Grehan of the Buffalo Museum of Science in preparing a long list of traits (more than 40) that are shared by humans, orangutans and fossil hominids, suggesting that perhaps orangutans are our closest living relative. While this conflicts with the well-accepted view (based on molecular evidence) that chimpanzees hold that position, Grehan and Schwartz (in press) have illuminated a provocative fact: evolving Homo sapiens shared more physical traits with the orangutan, the most-arboreal great ape, than any other primate. One aspect of women's unique sexuality would have often proved fatal if early humans had been fully terrestrial. The ancient landscape had a variety of grizzly predators such as saber-toothed cats, cave bear and hyenas that ate whatever they could sniff out, hear, or see, including humans. A menstruating female would have been readily detected and tracked. This is why women who are menstruating are solicited to accompany bear-hunting expeditions in Alaska. Heavy blood flow for up to seven days of every month would be the most-unique "terrestrial adaptation" ever to adorn a female who lacked claws, fangs, speed, or strength. Adaptations more suited to an arboreal existence could be shrugged off as just another evolutionary conundrum if human females alone possessed them. Not by coincidence, complementary oddities are also found in our infants. One is the tendency for our young to screech at the top of their lungs to attract a parent's attention, especially when the parent is out of sight. Large, adult, terrestrial animals and their young follow the basic tenet of terrestrial life that silence is golden. After dropping from the womb, the young often remain quietly huddled under the cover of grass and shrubs. Only in dire circumstances do they cry out for a parent, because there could be no sweeter music to a predator's ear than a screaming, defenseless, unguarded infant. The explanation of this trait as an adaption to terrestrial life is untenable. All mammals are born with the exact instincts they will need to survive in the habitat where they will live. Ungulates quickly learn to stand and run; our infants experiment with climbing well before they can walk. As they mature, children are irresistibly drawn to playgrounds that often including a variety of acrobatic apparatus. An instinctual attraction to a simulated arboreal habitat, as well as treehouses, would be expected of a scansorial species that was once dependent on trees. It was only recently, in our evolution, that one of the quintessential adaptions for travel in trees was lost. Experts like Ian Tattersal of the American Museum of Natural History conclude that before 30,000 years ago most of our potential predecessors were as much as two to three times stronger than us. While working on a NOVA television program entitled Orangutans in the Rain Forest, I watched in awe as a Dyak tribesman climbed barehanded over a hundred feet above ground to reach my position in the canopy. Not even large male orangutans ventured to this height, and they are much stronger than humans. This underlines the astounding arboreal potentiality locked in the stout physiques of archaic humans, males, females and children. Nothing drives a new theory better than a mechanism. Some may remember when Wegener's theory of continental-drift was taught as a curiosity. Curiosity turned to astonishment when the sea floor was mapped and the mechanism " sea floor spreading' established that continents really are moving. But before this mechanism was discovered, the theory was largely ignored. Looking through arboreal glasses, a mechanism for human evolution emerges from data concerning body-form changes that occur when species emigrate to new habitats. Major changes in lifestyle produce visible skeletal alterations. Whale bones conclusively demonstrate that these animals relocated from a terrestrial to an aquatic habitat. If humans underwent a shift in their way of life to become more terrestrial, these changes should be evident in fossilized skeletal remains. The mechanism of human evolution came to me in 2004 while reading a paper by J. Lee Kanvanau, of the department of Ecology and Evolutionary Biology at the University of California at Los Angeles. He discussed the arboreal origin of flight in birds and its effects on body shape while citing Gregory Paul's book, Dinosaurs of the Air: The Evolution and Loss of Flight in Dinosaurs and Birds, 2002. This fully describes how body form changed when species switched from using their arms for flight to walking full-time at the ground on two legs, as was the case with moas and ostriches. Shifting from an aerodynamic design where the body is carried by the upper torso, to carrying the body's full weight on two legs on the ground sets the stage for an evolutionary transformation of the skeleton. Over time, arm and shoulder-girdle strength become reduced and the legs lengthen. Eric Trinkaus of Washington University and many others have studied human fossils from around 30,000 years ago, and like the role of Rosalind Franklin's x-ray photographs of DNA crystals in discovering the DNA molecule's double helix, their work is critical to interpreting modern human origins. They describe changes in the evolving human skeleton that are suspiciously similar to those of moas and ostriches. Humans display a profound decrease in upper torso/arm strength and increasing leg length that signal a dramatic shift in their way of life. This mechanism helps us understand another enigma. Thirty thousand years ago, modern human predecessors known as CroMagnons and their more-ancient, robust counterparts, the Neandertals, simultaneously inhabited the earth. At that time, Neandertals were mysteriously beginning to disappear. Although they were stronger, it is often suggested CroMagnons exterminated them. But around that same time a climatic change with much lower temperatures took place, and extensive studies show that forests receded dramatically in response. As might be expected, the more tree-dependent body form of Neandertals followed suit. A smoking gun establishing that humans were beginning to spend more time at the ground is frozen in the details of thigh-bone cross sections from archaic ancestors and modern humans. Robust, archaic legs look much like ape legs. Their uniformly thick walls indicate mechanical loading similar to apes. Their legs were used for extensive climbing. Meanwhile, cross sections of CroMagnon thigh bones resemble those of living humans. Unlike stronger archaic humans, these more-modern humans spent much more time hiking on the ground. While it is clear that modern humans originated from a robust ancestor, exactly which ancestor, as well as the timing, are hotly debated. Still, the evolutionary mechanism for this change appears firm: our weaker body design is the result of spending more time at the ground. Modern humans have recently undergone what I call an arbo-terrestrial transformation. The terrestrial theory advances a different explanation. The apelike, leg-bone cross sections of archaic humans are thought to have been due to a unique form of terrestrial locomotion unknown today. One explanation states that perhaps archaic humans ran up and down mountain slopes where jumping between rocks was common. But this bone structure has not been reported in humans who live in mountainous areas. Nor does hopping about on steep slopes explain why the upper torsos of archaic humans would be the envy of every muscle builder. Unfortunately, there are no telltale fossil videotapes. But a scientific convention exists for choosing the preferred explanation. Known as Occam's razor, the simplest interpretation that accounts for the most data should prevail. The scansorial theory advocates a single behavior that accounts for the arm and leg strength of robust, archaic humans: climbing. This explanation accounts for many other odd aspects of human nature as well. For many people, climbing ancestors conger up an image of lowbrowed, hairy dimwits swinging on branches. Indeed, there is genuine doubt about the IQ of our robust, archaic predecessors due to the monotony of their tool types. A few stone points and scrapers with little variation in design dominate the archeological record for over hundreds of thousands of years, a sure indicator of abiding intellectual stagnation. Perhaps the best defense of ancient ancestral intelligence comes from the Korowai, a tribe of climbing humans that live in Irian Jaya, Papua New Guinea. Their bare-bones existence depends only on the bow and arrow, a couple of stone tools and a few trinkets, implying a paucity of tool types on a par with archaic humans. Korowai tree houses, however, are magnificent feats of construction that challenge the cognitive capacities of civilization's best builders. They climb barehanded and construct their dwellings as high as 150 feet above ground. Imagine that an anthropologist has been catapulted ten thousand years into the future to the site of a Korowai tree house. Because environmental factors would have long since decomposed the marvelous tree house and even the tree itself, the investigation would focus on refuse at the ground. This would reveal a meager distribution of simple tools with little indication of how the people lived. One day, a full skeleton is found. The dictates of the terrestrial theory would lead to several conclusions. The Korowai's modern human form would be identified as 100% terrestrial, despite its obvious scansorial nature. A lack of inventions would translate into low intelligence and possibly little use of language, both incorrect. Furthermore, the terrestrial theory would interpret the scattering of tools and bones as proof that the Korowai lived in modest shelters at the ground. Massive efforts of generations of scientists have created a sound foundation to replace the terrestrial theory that allows a profound biological principle to emerge. The new law of encephalization states: relatively large brains have never evolved at the ground. 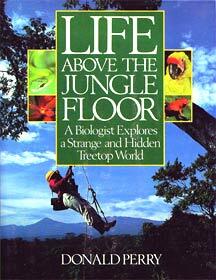 Outside of aquatic environments, only tree-climbing species have attained a relatively large brain. The habitat of human brain evolution has been found. Click hear to download THE DESCENT.